p, but I’m not sure it’s the route to bring him the big bucks. The environment, and the buzz surrounding the show was great, it was exactly what I would have wanted and hoped for walking into a venue that exclusively holds comedy events. The other thing, and much bigger thing if I’m being honest, pertained to food. I tried Ethiopian food for the first time, and my goodness, I don’t think I’ve ever left a meal being as full as I was after eating that. 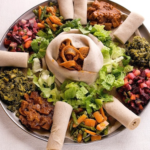 As I soon discovered, one of the common ways to eat Ethiopian food is to eat it family style out of these giant plates, and then you pick up the pieces of meat with this little pancake like bread stuff. That’s my best description of the food that I was eating, I truthfully wasn’t that sure of what I was eating, I know that there was some lamb on the plate, and I think possibly some chicken, too, but again, can’t even confirm, I was going in blindly and very much enjoying what I was eating. Which unfortunately, leaves me unable to provide any suggestions as to what to order if you go to an Ethiopian restaurant, but I just know that you should go. To wrap it all up though, try new things. I’ve been trying to do it more, and turns out, it’s usually fun.